On 29. 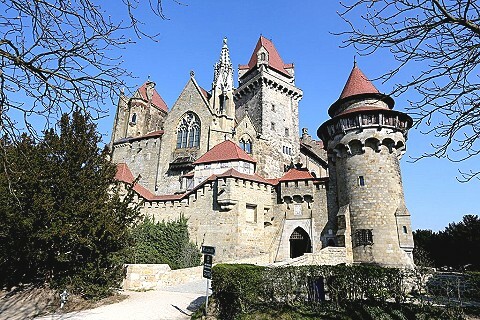 March 2014, the Lazarus Union organized a series of back-to-back meetings at Castle Kreuzenstein, the titular seat of the Union - CSLI. Firstly there was the statutory general assembly to be held, with a comprehensive agenda. This was followed by the General Assembly of the Naval Comradeship Vice Admiral Archduke Ferdinand Max – CSLI, which was then followed by the convening of the Commandery Leopold II of the Order of St Joachim, an allied chivalric organisation operating closely with the Union - CSLI and finally the General Assembly of the Corps Saint Lazarus Austria – CSLA. After the welcoming from the president of Union - CSLI Wolfgang Steinhardt, the usual protocol procedures were put into action. An important item was a statutory change which put a stronger emphasis on the international aspects of the CSLI. Representatives of our international affiliated organisations are now represented in the advisory board as well as in the board of management. The report of the president gave a full account of the 2013 activities in the form of a most informative power point slide set. The CSLI was present at over 100 events and with the 7th Handicapped Air Day, it had its own big initiative which received extensive coverage in Austria. The LAZARUS UNION is also proud to announce that the United Nation‘s ECOSOC (Economic and Social Council) Committee for NGOs has recommended to ECOSOC in the 4th and 5th meeting of the 1st NGO consultation meeting 2014 in New York to award to the LAZARUS UNION the “SPECIAL CONSULTATIVE STATUS“ as a registered NGO. This gives the CSLI the right to participate in the meetings, to submit applications, and the opportunity to make representations. A glimpse on future activities: our investiture at Castle Kreuzenstein and participation at various events from friendly organisations, a charity concert for the Großweikersdorf fire brigade, and several performances by our music corps. Also planned is a participation in the airport festival of the FSV Stockerau 2000 with persons with disability again taking the centre stage. In 2015 an international friendship festival is in the planning: a symposium, a ball (Parkhotel Schönbrunn) , an investiture (Castle Kreuzenstein) and a social programme, together with the Hospitaller Order and the Order of St Joachim. First preparatory work has already been commenced, for details see our website. As always, the report of the auditors was very positive, especially mentioning the extremely low administration costs and the “allowance policy“ of the Lazarus Union (no expenses are paid to any volunteers whatsoever). The Lazarus Union is very proud of the fact that no organisation of comparable size is known (at least to us) with such low administration costs (below 2% of the total budget!). By motion of the auditors the work of the board and the treasurer was formally approved. To comply with the new statutes the board stepped back and new elections were held, organised by our chair Col. retd. Neidhart. All candidates were elected unanimously by secret ballot. Sadly our treasurer Comrade Leithner retired from his office and now is one of the board vice presidents. We are proud to have now several representatives from different countries with the chair as well as with the board. This underlines the international aspects of the CSLI. At the closing of the GA the president presented several awards to merited comrades. Then the marathon continued with the GA of the Naval Comradeship: the usual procedure with various reports. The board was elected anew also here. All decisions were unanimous here as well. 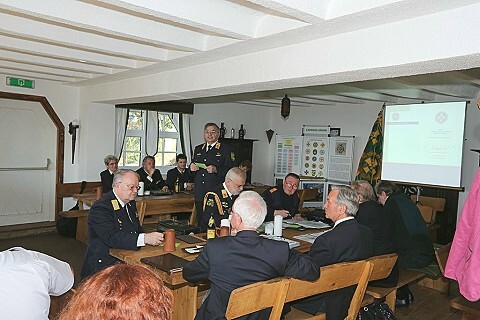 The final event was the GA of the Corps Saint Lazarus Austria – CSLA: report of the president, financial report etc. The chair stepped back here as well and was elected anew. President Leithner resigned, with the new president now being comrade Dr. Hochstöger. The board is also elected unanimously. 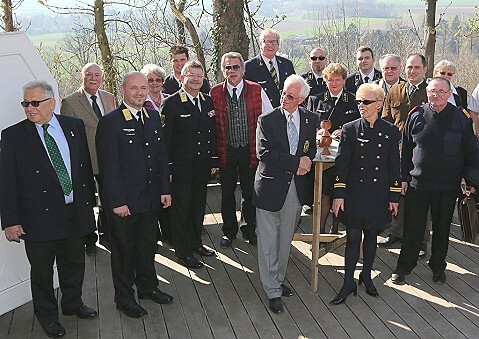 Then the president of the Lazarus Union, Senator h.c. Wolfgang Steinhardt, was awarded honorary membership in the Corps Saint Lazarus Austria-CSLA.